The Rose Art Museum has been closed for renovations since the end of April to prepare for next year’s 50th Anniversary celebration. For starters, the facade will be spruced up by the replacement of the existing curtain wall with new, more energy-efficient glass. 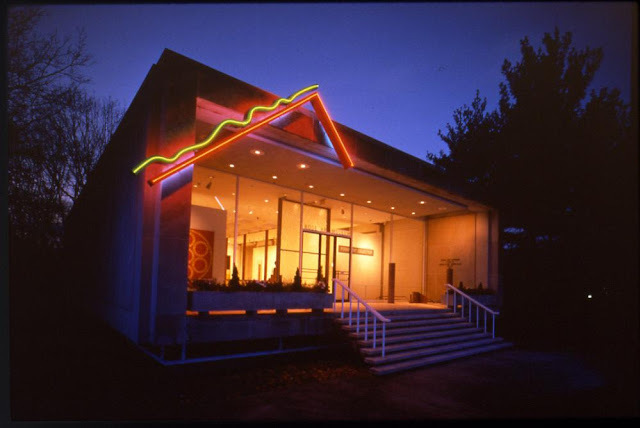 The Stephen Antonakos neon, a Rose signature since it was commissioned in 1985, will be removed to storage, and the original look of the building will presumably be restored. Embedded in that last sentence alone are a couple of stories that should go on the record. (1) The commission was scheduled for installation a few months before an exhibition of Antonakos neons and drawings would open in the museum on May 5. Everything was going as planned—the Collections Committee had enthusiastically endorsed the project, the electrical system had been prepared, the sculpture itself was being fabricated—none of which surprised me at that point, because working with Steve had been a dream from square one: Whatever he promised, he delivered. What did surprise me, when I excitedly mentioned the approaching installation to a couple of faculty colleagues I played tennis with every Friday afternoon, was the question one of them immediately raised about whether I had informed my boss, Brandeis President Evelyn Handler, about the project. Q: Why would I do that? A: It would be a good idea, just do it. So I wrote the president a memo. First thing the next day, the phone was ringing off the hook. The president herself, telling me to stop everything, I had no jurisdiction outside the museum’s front door—that territory was hers! So we met, we talked, I made a presentation, the dust settled, and the project continued. And I learned my lesson: My colleagues and I ran the museum program and guided its aesthetic and intellectual content, but the building and its physical contents, including artworks housed there or elsewhere, were university property. (2) You see in the accompanying photograph that the curtain wall consists of two large sheets of glass on either side of the entry doors, each measuring 14 feet high and 6 feet wide. But that’s not what you would see if you went to the museum today, nor what you would have seen at any time since 1989, which would have been four sheets on either side of the entry, each 14 feet high but only 3 feet wide. What brought about the change was this. We had a Dorothea Rockburne exhibition in the spring of 1989, which was curated by friend and colleague Susan Stoops. It comprised a very beautiful series of very abstract, ethereal pictures whose spiritual energy was best experienced in contemplative surroundings—as in a chapel. Dorothea wanted the gallery darkened, so preparator Roger Kizik went to the roof and covered its dozen skylights with a large canvas tarpaulin. Still, too much light flooded the gallery, so we went out and bought several huge rolls of opaque, heavy-weight, midnight blue paper—the kind of paper photographers use to create seamless abstract backdrops—that Roger fashioned to cover the entire inside of the curtain wall, every inch of it. And Dorothea was satisfied, her show could go on. But not without a hitch, for the very next morning—and a wonderfully sunny spring morning it was—Roger came to my office and insisted I accompany him to the front porch of the museum where we helplessly watched in horror as a large crack made its way across the glass panel on the left side of the entry doors. Physics had taken over: The sun shone directly on the museum façade, the dark paper absorbed the warmth and heated the glass, the glass in its steel frame was allowed no tolerance for expansion and so became the weak link in a chain of events we started but in which nature—as always—batted last. And an expensive weak link it was, which the university decided to reduce by replacing the 14 x 6 foot sheet of glass with two 14 x 3 foot sheets of glass. As this altered the symmetry of the curtain wall, decorative mullions were installed in the centers of original panels to correct the imbalance, and there they remain to this day. (1) The pool which visitors always loved, as the gentle tinkling of its sprinklers calmed the humors, encouraged aesthetic contemplation, and occasionally even inspired the tossing of a coin to accompany a wish. (2) The pool which drove us crazy, because it was forever interrupting sight lines, because its edge was always there to trip over when you backed up to better look at a painting, because you invariably had to turn the sprinklers off in order to be heard by a class or the audience attending a gallery talk. (3) The pool which we annually drained, to collect the aforementioned coins, but mostly to enable Roger to wash from the polished stones that came with the pool the slime that inevitably coated them, despite the gallons of chlorine we constantly poured into it in a futile effort to contain its tropical effect. (4) The pool that Judy Pfaff memorably incorporated into her “Elephant” installation in 1995 (see Curatorial Flashbacks #6). (5) The pool with a circular island in its center where Charlotte Mormon, wearing the “TV Bra” designed for her by Nam June Paik and—quite literally—risking electrocution in the process, gave a solo cello performance in conjunction with the legendary exhibition, “Vision and Television”, curated in 1970 by then assistant director Russell Connor. (6) The pool which, in spite of its faults, came to the rescue when the roof drains clogged with ice one winter day, and melt water cascaded into its embrace under the watchful eyes of Willem de Kooning, Robert Motherwell, and Helen Frankenthaler, among other dignitaries who happened to be hanging nearby. New floors and ceilings and lights will also be installed, along with up-to-date heating, ventilation and air conditioning systems. All of which sounds great. I wonder if it means the For Sale sign has been taken off the storage vault door. Heck if they are doing that much, wouldn't it be cheaper just to build a whole new building like the old one but bigger? Thanks again Carl for these wonderful flashbacks. For me...I don't think I would have told the president about the installation at all. Better to ask for forgiveness than permission. These are stories only you could tell. Thank you for this Carl. This is very interesting particularly for those of us who have a long history with that building.